The Clematis ‘Jackmanii’ at the entrance to the garden was greening by February 24 this year and its first flower opened on March 30. Jackmanii is an easy-to-grow hybrid with large 5-7-inch dark purple flowers. Today I noticed the clematis is looking lovely. It started blooming before I even thought about pruning, which is supposed to be done in late winter. Maybe it too late now to try to prune it? I do not know if it is advisable at this point. 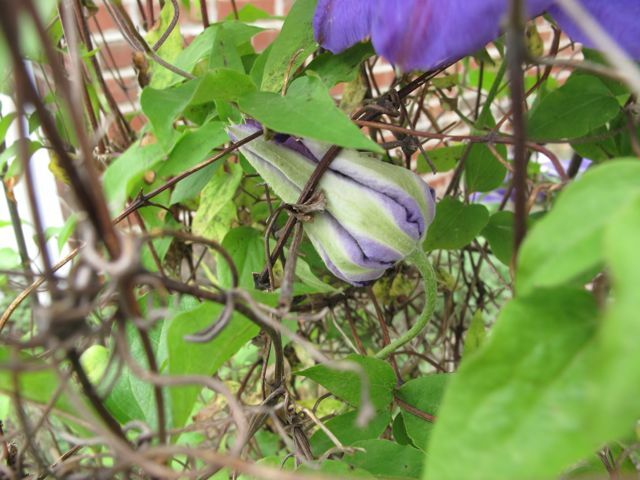 This entry was posted in garden and tagged clematis jackmanii, pruning on April 5, 2012 by pbmgarden. I love your last photo. It shows the richness of the flower colour. Thank you.I love flowers in that blue to purple range. Your photos really show off this pretty flower! Beautiful colour with the violet streaks and centre. Thank very much. It is an amazing flower.